Coral Brantly of Petoskey High School, was named the 2015 Michigan Poetry Out Loud State Champion after a day-long recitation competition at Dart Auditorium at Lansing Community College on March 13. Brantly took top honors among 33 student competitors, reciting “The Maid’s Lament” by Walter Savage Landor in her final round. First runner-up was Cal Kreiner of Wellspring Preparatory High School (Grand Rapids), second runner-up was Malik Childs of Cass Technical High School, and third runner-up was Ejiro Enajero of Detroit School of Arts. 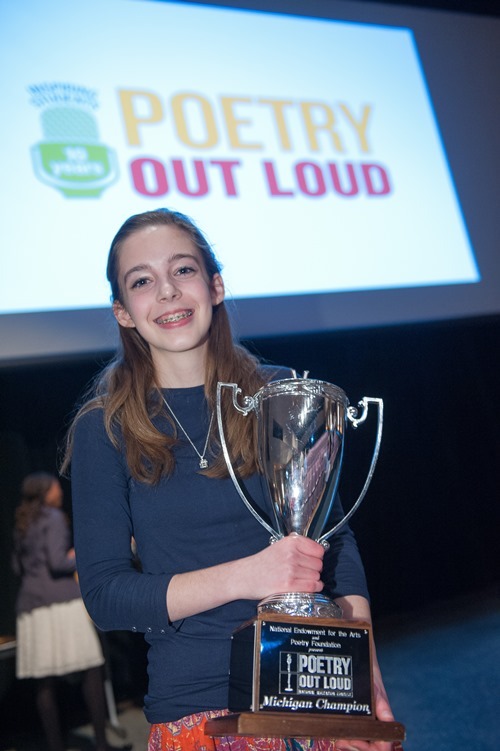 As the state champion, Brantly received a $200 cash award, $500 stipend for her school and an all-expenses-paid trip to Washington, D.C. to represent Michigan at the National Poetry Out Loud competition April 27-29, 2015. The national competition will be live-streamed at www.poetryoutloud.org. Kreiner, as runner-up, received a $100 cash award and $200 for his school. All four state finalists received plaques commemorating their achievement. The national champion will receive a $20,000 college scholarship. The program is open to all high schools, including home-school groups. Registration for the next program will open this fall. If teachers or parents would like to learn more about this program, please click here or call 517-372-7770. * provide the humanities with leadership and a public voice in Michigan.